Here is a video taken during the hustings for the local political parties held at Chesteron School on the 28th April, 2016. Don't forget the HPERA AGM and wine-and-pud evening. We have now submitted the official HPERA response to the Cambridge City Deal Milton Road Proposal, so it's time to think beyond this single issue. Also take note of the date for the HPERA AGM evening. Western Orbital consultation ends 21 March 2016. The consultation period for the Western Orbital Plans ends on 21st March 2016. Details of the plans and a list of times for drop-in meetings with the planners can be found here. The Milton Road 'Save the Trees' petition is well under way. The Cambridge News ran an article about the petition - you can read about it here. The link to sign and support the petition is here. WIth looming deadline of the comments on the Milton Rd poroposal, we can forget that there are other developments being planned. Here is the redevelopment proposal for the Miton Rd Library site and Have Your Say questionnaire. The plans will be displayed in the Milton Road Library till 8th March and the attached documents will be available on the Cambridgeshire County Council Library website till 8th March. A summary of the HPERA response to the proposed 'City Deal' - deadline is 15 February 2016. There are major concerns from residents that the City Deal proposals will compromise safety, health and quality of life for residents, and lead to environmental degradation and pollution. Alternative proposals to achieve the City Deal's aims are suggested. Hurst Park Estate Residents' Association (HPERA), which represents around 450 households/1000 residents, has considered the City Deal Proposals carefully and has the following comments. We support the broad aims of the proposals, and agree that residents and commuters should be encouraged to use public transport and bicycles instead of cars. However, we think the specific actions outlined in the proposals would have undesirable consequences for the local population, and that some of the underpinning assumptions are incorrect. We propose some alternative measures. Residents are extremely concerned that the proposed changes to routing around Milton Road will: increase traffic flow through the Hurst Park Estate, create rat-runs, and force detours for residents of one road (Highworth Avenue), compromising safety of residents and quality of life in the Estate, and causing environmental degradation; create rat-runs in other neighbourhoods (Ramsden Square, Lovell Road, Campkin Road), with similar consequences; increase the danger to children and parents on school runs on and around Milton Road as more vehicles access Hurst Park Avenue, Ascham Road and Gurney Way. The proposed road restrictions in the vicinity of the Hurst Park Estate and the rat-runs that will be created will lead to significant pollution and health hazards. In particular, the annual mass of greenhouse gas emissions will be of the order of 50 tonnes CO2e which is equivalent to the emissions attributed to 30 seats on trans-atlantic air journeys. The proposal to replace the Highworth Roundabout is flawed. Traffic on the roundabout currently runs smoothly for much of the day and it is attractive with a "country" feel, enjoyed not just by local residents. The proposed replacement traffic lights would delay traffic flow on Milton Road at all times of day, increase noise, pollution and energy use, and be unattractive. The argument that the roundabout is more dangerous for cyclists than traffic lights is not, in our view, sufficiently compelling. Accident statistics show clearly that this roundabout is not an “accident black-spot” and its removal is unwarranted on such grounds. Residents are strongly opposed to its removal, and suggest that modifications to the roundabout will meet safety concerns. The current proposal to widen the road to make a four-lane highway involves the removal of most of the trees, bushes and grass verges from Milton Road. This is not an acceptable state of affairs. We believe that cities should be planting more trees not destroying them. • The lack of information about how an increase in bus traffic will be dealt with at Mitcham’s Corner and the City Centre leaves the impression that Milton Road could become a bus-lane corridor without a destination. Retain the Highworth roundabout, and make modifications to address safety concerns and improve traffic flow further (described in 5.2 p.21 and Appendix G). Abandon the no-right-turn into Arbury Rd measure and, instead, improve the safety of the existing junction by: moving the bus stops- one to north side of the junction along Milton Rd, the other to lay-by further south; implementing a right filter and improve the signal phasing. Extend the left filter on Milton Road approaching the Arbury Road lights to divert vehicles from the central lane earlier and reduce tailbacks. Abandon the no-right-turn measure for Milton Road south-bound at Gilbert Road and, instead, re-configure the junction slightly to north-west and re-implement a right-filter. Incentivise commuters to use existing and new P&R sites which are properly sheltered, free (or low cost) and are destinations in themselves – offering franchises for Car-Wash, mini- mart, collect+ parcel pick-up and so on. Incentivise bus use by implementing off-bus or cashless ticketing with extended service times to/from P&R sites. Press ahead with orbital bus routes and the idea for a new Addenbrookes rail station to connect with Cambridge North. Mandatory pre-pay and booking for city-centre car parks – drivers on essential journeys are then guaranteed a space and others will no longer be cruising around and forming queues. Extension of parking restrictions into residential streets 1-2 miles out from the centre. HPERA stands ready to discuss these ideas, provide further evidence as required to support our arguments, and elaborate on our alternative suggestions. Dentist, Veterinary Practice etc. The proposed traffic turn restrictions and road closures will result in significant delays for cross-corridor traffic around Milton Road, significant inconvenience to residents and commuters needing to navigate local streets by car, and an increase in danger to pedestrians, noise, pollution and energy usage. Additional greenhouse gas emissions are conservatively calculated at 50 tonnes CO2e per year which will be exacerbated by loss of trees and greenery. Proceed on the basis of ‘doing least harm’. Make intelligent incremental changes at critical pinch points in the system as outlined in this report and measure the results, rather than embarking on major and irreversible road widening.  The rationale for the removal of the ‘Highworth roundabout’ and its replacement with a traffic light system is twofold: i) a perception that roundabouts are more dangerous for cyclists than traffic light systems, and ii) that a traffic light system will better regulate the flow of buses through City environs, avoiding the delays at roundabouts. In both cases, we believe that these justifications are flawed, and that the proposal flies in the face of trends in other countries. Leave the roundabout in place but make modifications as outlined in this report to improve traffic flow further. In particular, install new cycleways and footpaths to accommodate the particular needs of cyclists and pedestrians. Allow the grass to remain and the flowers to blossom. Modifications at pinch-points up-stream and down-stream in the system should help to improve the passage of buses in this section.  Current options for Milton Road will be to the detriment of the public realm and environment. Cities should be planting more trees, not getting rid of existing ones. They are the lungs of our community, provide an attractive environment and assist in cleaning up air pollution. Grass verges assist by providing natural drainage. Abandon ideas for a four-lane motorised highway. If smart, incremental modifications to the network fail to deliver the improvements required then consider a three-lane tidal flow arrangement. Consider bus gating through smart signalling during peak hours. Outside peak times, road space should be shared by public and private vehicles. Use the experience of Huntingdon Road where some cyclists prefer to travel in the ‘wrong’ direction on both sides of the highway rather than try to cross traffic lanes, risking collision with other traffic. There is anecdotal evidence of motor cyclists under-taking buses on Huntingdon Road by using the cycle lane. This should be banned and enforced by the police. The floating bus stops have not proved popular with passengers, can cause queueing and should not be implemented generally.  More ambitious plans are needed to encourage commuters from outside the City to use public transport. Provide more P&R hubs further out from the city in convenient locations which are properly sheltered, low-cost and are destinations in themselves – offering franchises for Car-Wash, mini- mart, collect+ parcel pick-up and so on. Ticketing should be off-bus or cashless and service hours should be extended to cater for user needs. Note: the implementation of charges at the existing P&R sites resulted in 500,000 less passenger journeys per annum (-14%). Provide better signage when drivers approach P&R sites to enable them to make a sustainable journey choice before embarking on a city-centre commute. Press ahead with the idea for a rail station at Addenbrookes to link up with Cambridge North. Encourage sixth- form colleges and private schools to start their day at 10.00am. Introduce mandatory pre-pay and booking for city-centre car parks – drivers on essential journeys will then be guaranteed a space and others will no longer be cruising around and forming queues. Extend parking restrictions into residential streets 1-2 miles out from the centre. Consider road charging at peak times for all road users (would also generate income to subsidise P&R running costs). Need help with your consultation response? The Milton Rd RA has conveniently shared with us some useful advice on what you might want to include in your response to the Milton Rd plan. The consultation ends on Monday 15 February 2016. Please let the City Deal know your views by filling in the Questionnaire but remember you don’t need to answer all the questions. We have been assured that general comments will be read and analysed. However, in practice, this means that the reader will pick out key points and then total them. If you agree with any of the following, please do mention them in either the comments box on the questionnaire or in any sheet you attach. Consider the Alternative Ideas raised at the meeting on 21 January. There are only a few more days to go before you can complete the questionaire about the proposals for Milton Road. You can follow the link here to the website. Thanks to all those who attended the meeting on 4 February 2016. Public North Area Committee meeting, Chesterton Community College, Cambridge. Thank you to everyone who came to the meeting to ask questions. Every seat was taken and many people had to stand at the back and along the sides. The three hour meeting sparked heated discussions and the strength of feeling about the proposals was obvious. Remember that the deadline for feedback on the proposals to Milton Rd is the 15th Feb, which is a week away! If you haven't done the paper or on-line response, we urge you to do that in the next few days. The on-line version can be accessed here. A Cambridge News news article today say that 'Residents in streets off Cambridge's Milton Road fear rat-running chaos if council bosses push ahead with proposals to curb traffic nearby. Officials are keen to give buses and bikes more priority in Milton Road as part of the City Deal transport master plan, including removing trees to enable the route to be widened. But people living close by say hundreds of cars already flood their residential roads at peak times, and making Milton Road less car-friendly will prompt motorists to seek alternative routes'. On Thursday 4 February an important meeting for the North Cambridge committee is taking place at Chesterton Community College, Gilbert Road. It will be an ideal opportunity for residents of the area to hear about the City Deal and offer alternative proposals. Here is the agenda for the evening. Details for your local councillors can be found in the links below. There are three councillors per ward. You can find out more about how the City Deal is governed and organised here. "Commuters could be banned from parking in Cambridge's residential streets after councillors called for a radical overhaul in policy to cut congestion". "A Cambridge transport system with bus lanes down the middle of the city's major roads has the 'wow factor' to succeed, say campaigners – and has been backed by bosses in charge of the £500 million City Deal. The 'Streetcar We Desire' project, spearheaded by Coton parish councillors Helen Bradbury and Dr Gabriel Fox, is a radical interpretation of the bus-based system likely to be implemented by the City Deal. Their fresh vision, though, relies on the concept of 'bus rapid transit' – with buses able to travel in both directions on 'centre lane expressways' along Cambridge's major radial routes like Histon Road, Madingley Road and Milton Road. Dr Fox told Friday's City Deal board meeting that transport schemes needed to have a "wow factor" to be successful". What's the deal for the Milton Road junction? Cambridge News: What’s the Deal for the Milton Road junction? With the new station development plans pushed back to 2017 the focus is now on the Milton Road/Elizabeth Way roundabout. 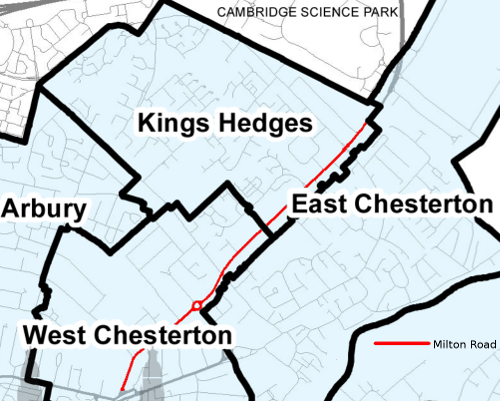 The proposals for the Greater Cambridge City Deal include the removal of the much-loved trees along Milton Road. The trees and hedges that align this stretch of road have many benefits to the wider community including a welcome vista of soft greenery amongst the solid, grey tarmac. The Milton Road Residents Association has organised a petition to save the trees and verges along Milton Road. Please go to their website, read all about it, and more importantly follow the links and add your name to the petition. An important meeting organised by the Milton Road Resident's Association is taking place on Thurs 21st January at 7pm at Chesterton Community College. Alternative solutions in response to the Milton Road proposals will be presented and discussed. Come along and help support your local community if you can. The first newsletter of the Hurst Park Estate Residents' Association has been published. Paper copies will be distributed in the area, and it will soon be emailed out to those who have registered their email with us. If you missed the meeting of the newly formed Hust Park Estate Resident's Association on Wenesday 6 January 2016 then please follow the link here to see the video. The on-line version can be found here. More than 150 people packed into the Church of The Good Shepherd last night at the inaugural meeting of the Hurst Park Residents Association (HPERA). Main item on the agenda was the proposal for Milton Road development under the Cambridge City Deal. The public consultation document came under fire from residents for ignoring the interests of communities living alongside the so-called Milton Road ‘corridor’. Maps were shown which clearly illustrated that the proposed closure of side streets and restricted turns off Milton Road would turn residential roads into rat-runs causing environmental damage and endangering cyclists, the elderly and children on their way to the local school. A presentation from Edward Leigh of Smarter Cambridge Transport showed that there are alternative ways of improving traffic flow for buses during peak periods using modern signalling technology without having to devote acres of space to dedicated bus lanes involving the loss of trees and verges along Milton Road. The Residents' Association will be working hard to come up with alternative proposals to present, and will encourage residents to contact them with ideas as well as submitting their own individual responses during the consultation period. The deadline for submissions is 15th February. Letters have been sent around to all the residents notifying them of the launch of the Hurst Park Residents Association, which is being rapidly created to provide a forum of the residents of Hurst Park Avenue, Orchard Avenue, HIghfield Avenue, Leys Avenue, Leys Road, and Highworth Avenue to respond to the proposed changes to Milton Road, which has the potential to affect all residents in the estate. If you can, please attend the inaugural meeting which is being held to formalize this Residences Association, and to start the discussion of the proposed changes to Milton Road. Come and hear, and have your say, about the Cambridge growth agenda, the City Deal and the impact on the people of Cambridge.